Kids can make great online history exhibits cheap. Can museums? 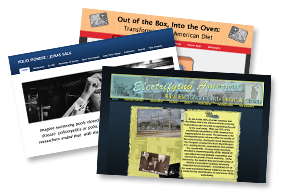 I can’t show you the sites I reviewed, but here are 3 winning examples from 2010: Electrifying America; Polio Pioneer; and Out of the Box, Into the Oven. Like museums in the physical world, WebExhibits presents information that is, for the most part, timeless. Yet WebExhibits also demonstrates a radical departure from physical museums, in terms of 24/7 accessibility, adaptation to support multiple learning styles, and cost-effectiveness. As of October 2010, 75% of U.S. households have high-speed Internet access, and virtually all students have Internet access at schools or libraries. Virtual exhibits are cost effective. It costs only a few pennies to serve a WebExhibits visitor, in contrast with a typical U.S. museum’s cost of $23 per visitor.